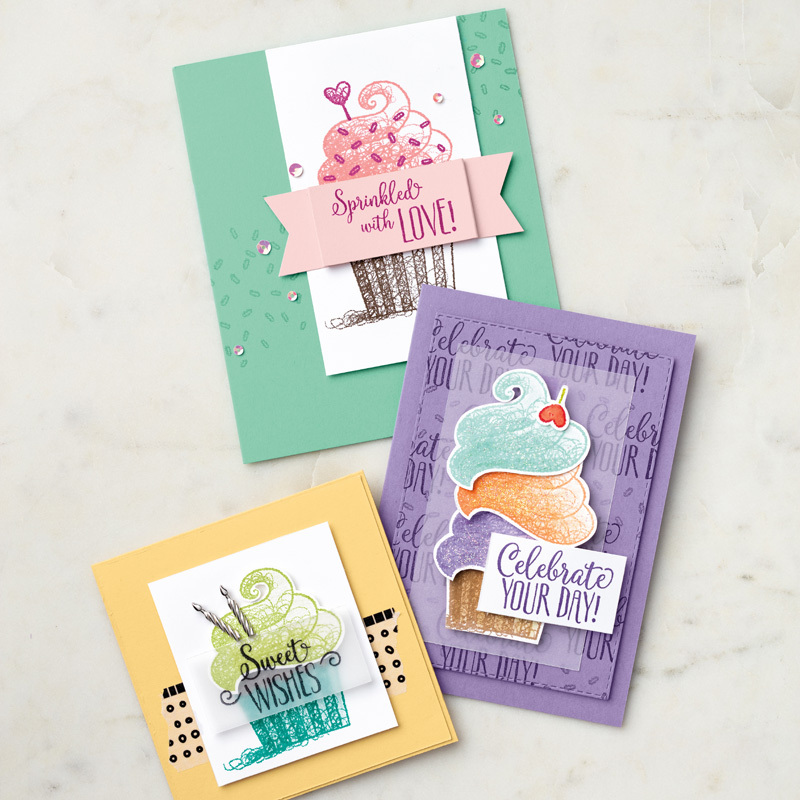 You’ve seen some cute samples from our Sale-a-bration catalog … Well, I’ve got more for you today!! I don’t know about you but the Hello Cupcake is a fun and easy way to say Happy Birthday, and with the release of the coordinating Thinlits dies in March, it just adds the cherry on top!! The banner on the top card gives some great dimension while the sequins adds some texture and a touch of bling. Those dies are going to come in handy if you want to recreate our center card and celebrate the day. I love the technique of creating your background by stamping the greeting and then using the Vellum Cardstock to highlight your cupcakes. Our last of the cupcakes also uses the Vellum Cardstock but showcases the “Sweet Wishes” by stamping right on it while still allowing your cupcake to peek through. And the candle embellishments really add a nice touch to this gift card. The next card is teasing you with the new “All Adorned” stamp set which is part of the Second Release to our Sale-a-bration catalog. This is perfect timing for my “Sweetheart of a Deal” because using the Stamperatus with this set will give you perfect placement of your corner images. Here is my Sweetheart of a Deal … remember the second release items become active on the 15th of February. Thank you for stopping by my blog today. Let me know if you have any questions with it’s contents.